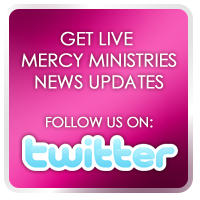 Mercy Ministries News: Have Mercy! Nancy Alcorn, the 47-year-old founding director of Mercy Ministries, is sitting in her suburban Nashville office holding a framed painting—and beaming. It's a simple watercolor of a ballerina painted by a girl living in one of the Mercy homes, part of the ministry Nancy established to help girls ages 13-28 who struggle with eating disorders, abuse, addictions, and unwed pregnancy. There's something about the painting—the innocence of this young dancer, her arms reaching heavenward—that prompted Nancy to have it framed to hang in her office. Perhaps it's that this hopeful image came from the brush strokes of a teen who had been impregnated by her sexually abusive father, the same man who beat her body into aborting the baby when he discovered she was going to have his child. Despite this young woman's traumatic circumstances, through Mercy Ministries she's discovering the healing that comes through a relationship with Jesus Christ. Nancy's seen enough such stories of God's redeeming mercy to fill a hundred office walls.